Continuing on from The Role of Fear in Selling where we looked at how the fear filter works, we continue to discuss the Trust barrier in selling. 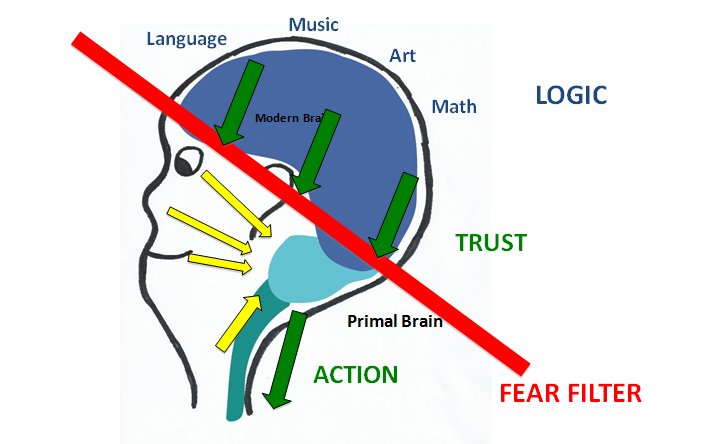 To recap, the fear filter separates the Primal brain and its flee or freeze or flight response and the Modern brain with all its logic and rational decision making; it’s the bit that can make or break your deal. Expanding on this, this article introduces you to the critical Trust barrier and how it is the foundation of stable buying decisions. As we established, the fear filter blocks your prospects from being able to think logically and rationally if there is any risk of harm in your sales processes. Now here’s another thing: the same filter, this same line, can stop data coming down to the primal brain where the ability to make a final decision resides. In short, information and data must pass UP to the Modern Brain and then DOWN again to the Primal brain for any decision to be made, as seen below. This means that the information you give a customer and the conversation you conduct with a customer has to pass through two filters in order for them to make a decision. We talked about the fight or flight mechanism and the survival instinct. As we mentioned, data doesn’t go up from the primal brain unless it’s not frightening, and when coming back down, the data will not come down from the modern brain unless it is trustworthy. And now we have the second filtering process – the Trust barrier. Now say your information gets past the prospects fear filter the first time your prospects are able to make sound, rational and logic decisions thanks to the modern brain. This information must once again come down and pass the trust barrier. So once again, your prospects are assessing the risk of decision. Will the decision to buy have any negative consequences? If it does then they will not make the purchase; that is, they cannot act on the decision despite having come to it in a logical and methodical way. To optimise your prospect’s decision process, you need to be really conscious of how to communicate data so that it is absorbed by the logical brain and processed complete enough for them to make a decision that they can confidently act out. Part of this is the way you explain things but an equal part is knowing their current knowledge and beliefs on this issue. Until you know what they already know and believe you cannot make sure the information you present will make enough sense to them to be trusted as correct and used reliable to make the decision to buy it. If you say something that contradicts their beliefs or they cannot understand completely they will not be able to use your information as part of their rational processes. Next, we’re going to talk about the data you present to your prospects. Tune in for the next article on how to gain their trust, overcome the fear filter and the trust barrier, and sell your product/service. This entry was posted in Blog, Training and tagged '', emotions in selling, fear filter, hiring sales people, hiring sales staff, presenting, recruiting sales people, recruiting sales staff, role of trust, sales inventory profile, Sales psychology, selling, SIP, trust barrier by Maya Saric. Bookmark the permalink.